The new line-up of agricultural equipment includes a wide range of high quality and energy-efficient mowers, rakes and tedders that the company is introducing across Africa, the Middle East and Europe. "Massey Ferguson is a highly successful manufacturer of a full line of tractors, material handling and harvesting equipment, including high quality combines and balers. 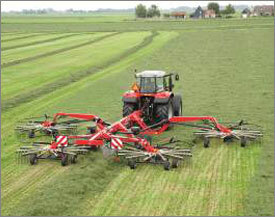 So it is a logical move to extend the brand portfolio into hay and forage implements," explained Campbell Scott, director of marketing services for Europe, Africa and Middle East at Massey Ferguson. The new DM series of mowers has options from two metres to 9.3 metres in width. It includes both entry-level and professional-level mounted mowers, centre drawbar machines as well as trailed mower conditioners and 'Butterfly' folding combinations with ISObus control. Many of the mowers are equipped with the driveGuard overload system which protects the driveline with simple and easy to fit 'tabs' rather than shear bolts or pins. Centre-drawbar mower conditioners in the range provide the benefit of being able to operate to the left and right, like a reversible plough. Tedders in the TD series include six models, four mounted and two trailed, that are available in working widths from 5.2 metres to 12.7 metres. Each model offers easily adjustable spreading angles of 15°, 18° and 20.5°, allowing them to be set to match all crop conditions. The mounted tedders provide a choice of four, six or eight rotors while the two trailed models come with eight or ten rotors. The rotor heads have an enclosed design that protects the components from dust and dirt, increasing the working life. Four single-rotor, four two-rotor and one flagship four-rotor rakes are available in the new RK series of rakes. The single-rotor rakes are linkage mounted with working widths from 3.6 metres to 4.5 metres while the two-rotor rakes are semi-mounted and come in options of working widths up to 10 metres. The four-rotor rake, which provides adjustable working widths up to 12.5 metres, is built for contractors and large-scale farmers requiring accurate swath formation at high work-rates. The semi-mounted, trailed chassis machine is designed for transport speeds up to 50 km/hour.